Obama defends administration's "unprecedented set of ethics rules." ELKHART, Indiana (CNN) -- Seeking to rekindle last year's election magic, President Obama traded the beltway for the heartland Monday, hitting the road to make the case for his controversial $838 billion stimulus package in a part of the country particularly hard hit by the economic downturn. President Obama takes a question in Elkhart, Indiana, Monday where he said doing nothing was "not an option." 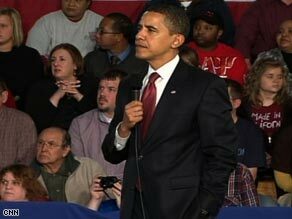 Addressing a raucous, campaign-style town hall meeting in Elkhart, Indiana, Obama warned that the road to economic recovery would take years, and that a failure to pass an effective stimulus plan quickly could result in an "economic crisis as deep and as dire as the Great Depression." The downturn could become a "crisis that at some point we may be unable to reverse," Obama told a packed high school gymnasium. "We can't afford to wait." The president took his case for the stimulus plan to a wider audience Monday night as he held his first prime-time White House news conference. Elkhart has seen its unemployment rate triple to more than 15 percent over the past year. The city's jobless rate is roughly double the national average; a number of the nation's top recreational vehicle makers are located in Elkhart, and hundreds of workers at those plants have lost their jobs. The president didn't travel to Elkhart "to explain Washington's process to them, but instead to highlight for Washington the problems and pain facing Americans," White House Press Secretary Robert Gibbs said. "All folks here are asking for is a chance to work hard -- and to have that work translate into a decent life for you and your family," Obama said. The president repeated a pledge that his plan would save or create 3 million to 4 million jobs over the next two years. He claimed that 90 percent of those jobs would be generated by the private sector, a rebuttal of some conservative critics who have argued that his plan amounts to little more than a government jobs bill. "I'm not going to tell you that this bill is perfect," Obama said. "But it is the right size, it is the right scope [and] broadly speaking it has the right priorities to create jobs that will jump-start our economy and transform this economy for the 21st century." While most of the crowd's questions were generally friendly, Obama was criticized by one audience member about the failure of several of his Cabinet nominees, including Treasury Secretary Tim Geithner and former Health and Human Services Secretary-designate Tom Daschle, to fully pay their federal taxes. "I think they were honest mistakes," Obama said. But, he added, "You can't expect one set of folks to not pay their taxes when everyone else is paying theirs ... I don't want to send this signal that there are two sets of rules." Obama argued that his administration had created an "unprecedented set of ethics rules." "We are changing the culture in Washington, and it's going to take some time," he said. iReport.com: Can Obama fix the economy? The Elkhart trip was Obama's first major face-to-face meeting with a group of ordinary Americans outside of Washington since taking office January 20. It also marked a return to the spot of one of the president's greatest political triumphs in the 2008 campaign. Obama stumped for votes in Elkhart twice last year -- in May and August -- before becoming the first Democrat in 44 years to carry the typically Republican state of Indiana. The president is planning a second campaign-style swing Tuesday, heading to Fort Myers, Florida, another city wrestling with double-digit unemployment. Leading Senate Republicans warned Sunday that the administration's stimulus plan will lead to what one called a "financial disaster." "Everybody on the street in America understands that," said Sen. Richard Shelby, the ranking Republican on the Senate Banking Committee. He told CNN's "State of the Union" that the package and efforts to shore up the struggling banking system will put the United States on "a road to financial disaster." But Lawrence Summers, the head of the administration's National Economic Council, said Republicans have lost their credibility on the issue. "Those who presided over the last eight years -- the eight years that brought us to the point where we inherit trillions of dollars of deficit, an economy that's collapsing more rapidly than at any time in the last 50 years -- don't seem to me in a strong position to lecture about the lessons of history," Summers told ABC's "This Week."